Monarch Air Group provides private air charter in Medellin, Colombia. Our clients benefit from top-notch service, unrelenting dedication to safety, wide selection of aircraft, and years of experience in chartering private jets. To obtain a free quote, please use our online quoting tool provided below, or call toll free 1-877-281-3051. Monarch Air Group provides private jet charter flights in and out of Medellin, Colombia. 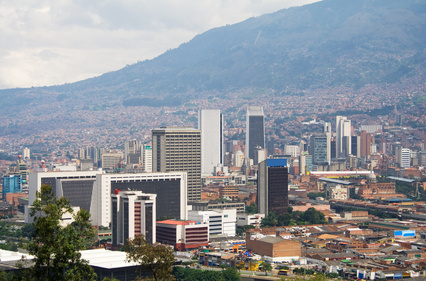 With a population of 2.7 million, Medellin is the second-largest city in Colombia. Located at 5,000 ft above sea level, Medellin has a humid subtropical climate. The city was founded in the scenic Aburrá valley in 1616, but remained small until the coffee boom. Today Medellin is a modern world-class city with the biggest collection of Fernando Botero’s works on display, luxurious restaurants, wonderful museums, and hotels. The major economic products are textiles, steel, confections, beverage and food, agriculture, chemical products and pharmaceuticals, public services, flowers, and refined oil. The most notable tourist attractions are Plaza Botero, Parque Explora, Museum of Antioquia, Bolivar Square, Palacio De Cultura “Rafael Uribe Uribe”. There are numerous festivals and events including Festival of the Flowers, International Poetry Festival, International Tango Festival, International Jazz Festival, Book Fair, Parade of Myths and Legends, Feria internacional del caballo, and Bullfighting Festival of La Macarena. Medellin is served by José María Córdova International Airport (MDE) and Olaya Herrera Airport (EOH). 1. ADN, Andes, Andes, Colombia. 2. AFI, Amalfi, Amalfi, Colombia.